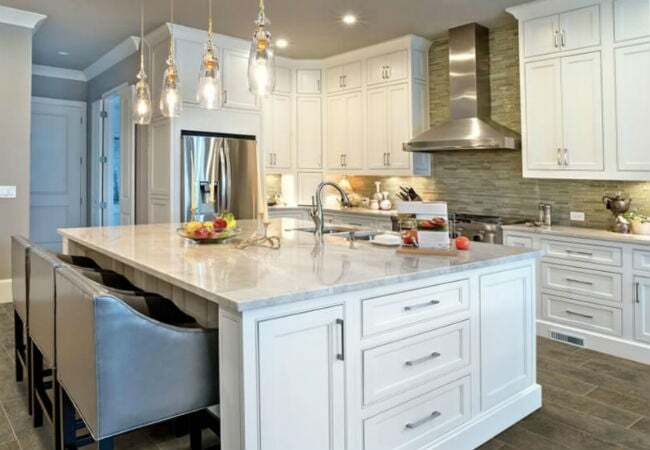 Quartz and quartzite, two high-end countertop materials derived from quartz, are so often confused that even retailers may use them interchangeably. But homeowners deciding between the two for a new countertop should know that the materials vary in composition, looks, maintenance, and durability. 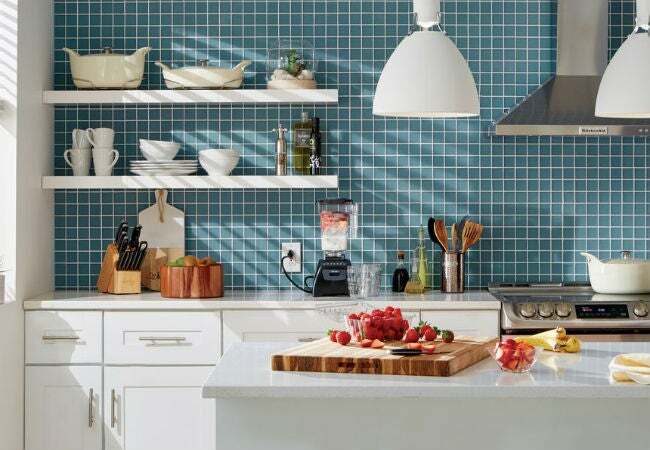 Read on for a detailed comparison of two similar countertop materials—quartz vs quartzite—to help you pick the perfect surface for your remodel. 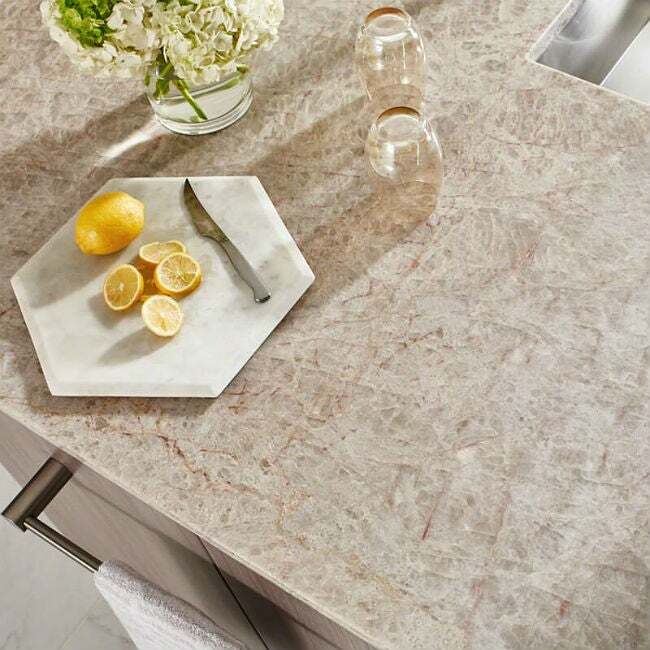 Consisting of 90 to 99 percent quartz grains bound by the mineral silica, quartzite is a natural stone that appeals to the eco-conscious because it’s made by nature and contains only naturally occurring components. It’s formed beneath the earth’s surface when quartz-rich sandstone is altered through high pressure and temperature, then mined and cut into slabs. Conversely, the quartz used in countertops is an engineered stone molded and baked into slabs in a factory. Only 90 to 94 percent of it is ground quartz mined from the earth; another 6 to 10 percent is man-made polymer resins and pigments that bind the ground quartz. Quartz comes in more colors and patterns. The pigments added to quartz can be used to achieve a wide spectrum of colors, from light blues to deep pinks, or even violet or orange. Similarly, quartz slabs can be flecked or veined in the factory to display diverse, uniform patterns across the slab. Quartzite comes primarily in shades of white or gray, though iron oxide in the stone can lend a pink or red hue. It’s also limited to the pattern created through natural formation—a veined finish that resembles granite or marble and bears visual inconsistencies from one end of the slab to the other. Quartzite has an earthier feel. Because quartzite slabs retain the granular, sugar-like texture of quartz-rich sandstone, they have a slightly coarser feel desirable to those who prefer countertops with a more organic vibe. The resin that binds ground quartz gives the slabs a smooth, seamless finish that imparts a somewhat manufactured look. 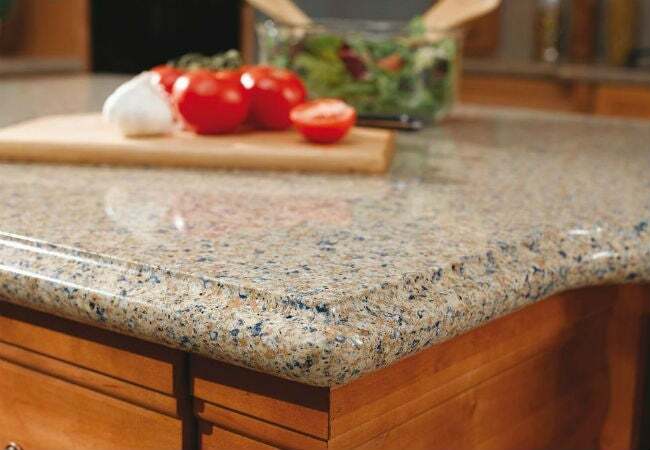 Quartz repels moisture and microbes without sealer. As a result of its binding process, the engineered stone has a non-porous surface that doesn’t require sealing. It serves as an effective barrier against moisture and microbes, making permanent staining and bacterial invasions unlikely. Keeping a quartz countertop clean simply calls for wiping up wet spills with a water-dampened cloth, or scrubbing dried spills with a soft sponge dampened with commercial surface cleaner. For routine cleaning, spray a store-bought or homemade surface cleaner over the entire countertop, let it dwell for 10 minutes, then wipe it down with a soft sponge. While quartzite can be cleaned using these same regimens, its porous surface is highly susceptible to staining and bacterial invasions if not sealed before installation and on an annual basis thereafter. This involves topping it with a natural stone sealer ($10 to $30 at home centers), letting the sealer soak in for 10 to 15 minutes, wiping the countertop down with a cloth, and then letting the sealer cure for 24 to 72 hours. Quartzite is more scratch- and acid-resistant. Registering between a 7 and 8 on the Moh’s mineral hardness scale, quartzite is slightly harder and more scratch-resistant than quartz (a 7 on the hardness scale). While an errant stroke of a knife blade is unlikely to ding or chip either material, you wouldn’t want to chop directly on quartz as the interaction between food acids and the resins in the countertop make it more prone to etching (a form of acid erosion that results in dull white spots). Light knifework directly on a quartzite countertop will not cause etching. Note that some retailers sell a countertop material called “soft quartzite,” which is actually marble, a material highly susceptible to etching. Always check with the retailer to ensure that the quartzite you buy is true quartzite. Quartzite can take the heat. Feel free to place hot baking dishes or pans on a quartzite countertop. The resin used to bind quartz, however, melts at around 300 degrees Fahrenheit, so a hot dish or pan could leave a permanent indentation or scorch mark on a quartz countertop. Expect to pay $60 to $150 per square foot (installed) for quartz countertops and $70 to $200 per square foot (installed) for quartzite. The price difference is due to the increased complexity of transforming mined quartzite into slabs. It must be cut to size with a diamond blade, an exacting task that yields slabs with no standard size (they vary widely even among individual retailers). Quartz is cheaper to produce because once it’s bound with resins and pigments, it’s poured into a mold and baked into standard-size slabs of 120 by 55 inches and a thickness of either two or three centimeters. Quartzite slabs weigh marginally less at around 20 pounds per square foot compared to 20 to 25 pounds per square foot for quartz slabs. This means neither of these hefty materials is recommended for do-it-yourself countertop installation.